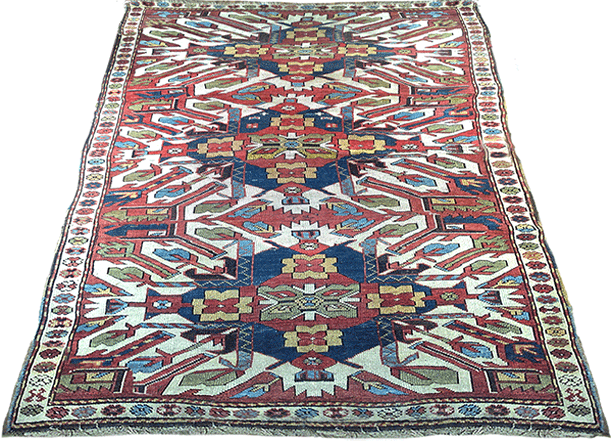 Nejad’s Chelaberd Eagle Kazak antique rug is a rare find and an excellent investment! One of the most sought after Caucasian rugs among serious Oriental rug collectors is the Chelaberd Eagle Kazak which is also sometimes called the Sunburst Kazak. The rug’s three center motifs are stylized sunburst medallions, representing life on earth and universal order. The foundation and pile are both hand spun wool colored with natural vegetable dyes. This rug also has the most desirable ivory background color and beautiful accents of gold, yellow and blues. restorations however this rug is in very good condition which makes it a rare find and an excellent investment! creation to be nothing but positive. and gratifying – whether they purchase a rug or not. most of all – the customer. most positive I can whether a sale is made or not. Life is simply too short to do otherwise. This Blog is In Loving Memory of My Mom.